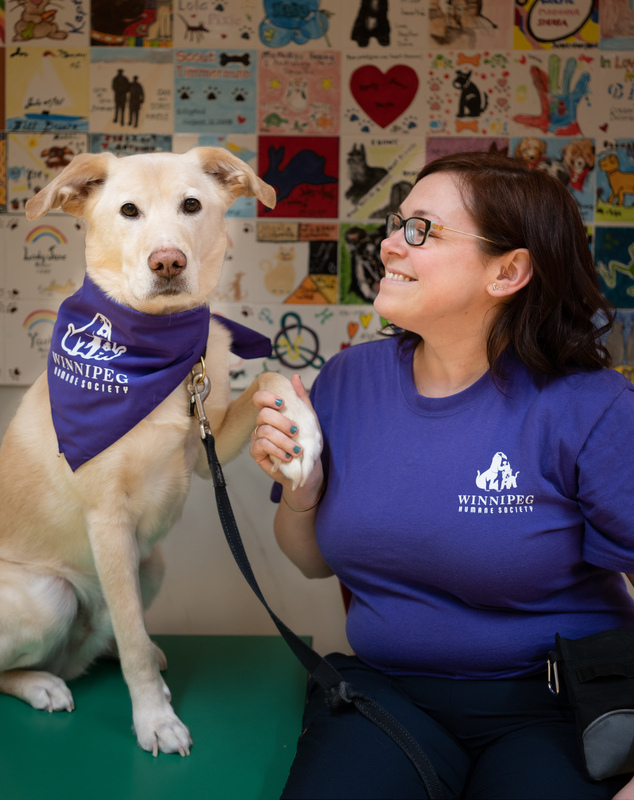 Many words can be used to describe characteristics of the volunteers of the Winnipeg Humane Society: dedication, commitment, determination, to name just a few. Volunteer Pam Rempel of the Education team embodies all these and more. As soon as they were approved, Pam started looking for the right match. One day the perfect fit came along, “and it wasn’t the kind of dog that I was thinking about initially. But, the Foster team thought that he would be just right for us when he was in a home.” Pam said. Enter Sandy, at that time a one-year-old Lab-Husky-Greyhound mix. Not what one would describe as an older, calmer, smaller dog. It seems though, like the kind of relationship you’d find in a movie. Sandy came into Pam’s home needing foster care while recovering after being hit by a car. It took him six months to heal completely. Then, the day came when he was ready to be returned to the WHS for adoption. “I was determined to fulfill my commitment to ‘love them and return them’ but I could not bring myself to leave the shelter without Sandy,” Pam said. Pam had helped nurse Sandy back to health, but the healing went both ways. Pam’s volunteer involvement with the Winnipeg Humane Society started with the Foster team but has expanded into several other areas. But Pam and Sandy mostly love to volunteer together. As an Ambassador Dog, Sandy goes with her to represent the WHS at public events and events at the shelter, like Kid Camps. They go to presentations at schools as often as they can, as it seems it is one of Sandy’s favourite things to do. They have also begun to participate in the brand-new Pet Empathy program for children. For an hour a week, over six weeks, a small group of specially selected students is paired with the same 2 Ambassador Dogs in order to interact and bond with them during group discussions. A WHS staff member leads each session, which deals with learning an empathetic attitude, particularly toward animals. As one of the Therapy dog teams, they attend “See Spot Read”, where a school brings students who may benefit from the chance to practice literacy skills in a novel way. They read aloud to Therapy Dogs for 10 weekly sessions. The students are paired with and read to the same dog for the duration of the program. They also do fun activities to encourage a love of reading. They build a tight friendship with their dog and can show significant improvement in their reading skills. Pam enjoys being an active volunteer in the variety of areas in which she’s involved. “We still foster, almost 8 years later. We often take care of some complicated medical cases, but I really enjoy it. And interacting with kids with Sandy at my side is so fulfilling. ” she said.